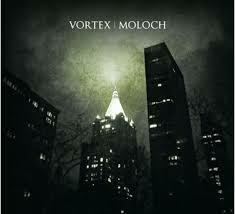 Self-described as an “apocalyptic soundtrack for urban decay,” German dark ambient project Vortex returns with their fourth album, Moloch. This offering features both airy keyboard patches and grinding guitar chords over subtle rhythms. Acoustic instrumentation includes strings and flutes, which provide a human feel to what might otherwise be a bleak, post-industrial hellscape. Like many of this genre, Vortex creates atmospheres rather than melodies. The guitar lines, in particular, are dense walls through which one can hear the throbbing and pulsing of a city at night. Some tracks, such as Hunted, combine the above approach with tribal rhythms, which results in a strange juxtaposition of the aboriginal and a near-future dystopia. As the album progresses, it takes on a more nuanced and introspective direction as times. Measured, single-note piano begins Skyline, though the track evolves into a guitar-laden, pounding theme. City by the Sea slowly builds up disturbing ambiance over the course of its windswept 14 minutes. This is a very strong release from Vortex – possibly their best yet.